Diep and I were very proud of how confident and knowledgeable our children were today during the student-led conferences. 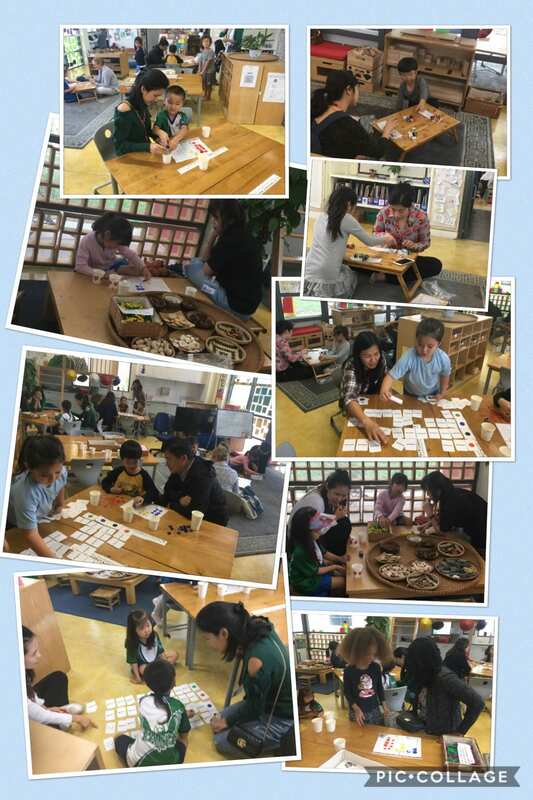 Student-led conference day is a lovely opportunity to observe and reflect on the students’ growth. I hope you enjoyed the day as much as we did. The book drive ends this week. So far our class has not collected any books. 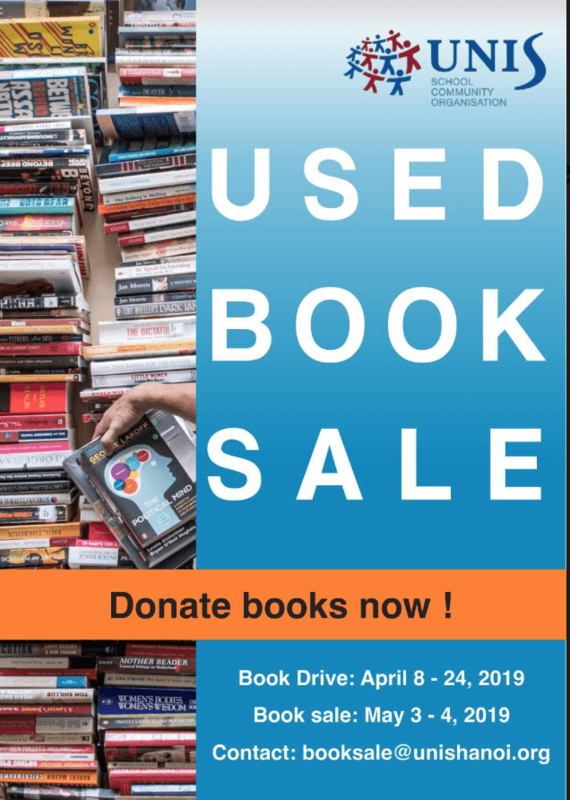 If you have a few books you no longer want lying around your house, please donate them to the book drive. Please join me in welcoming Noe and his family to K2D. Noe is from Germany and he has a younger sister, Emily, in Discovery at UNIS. 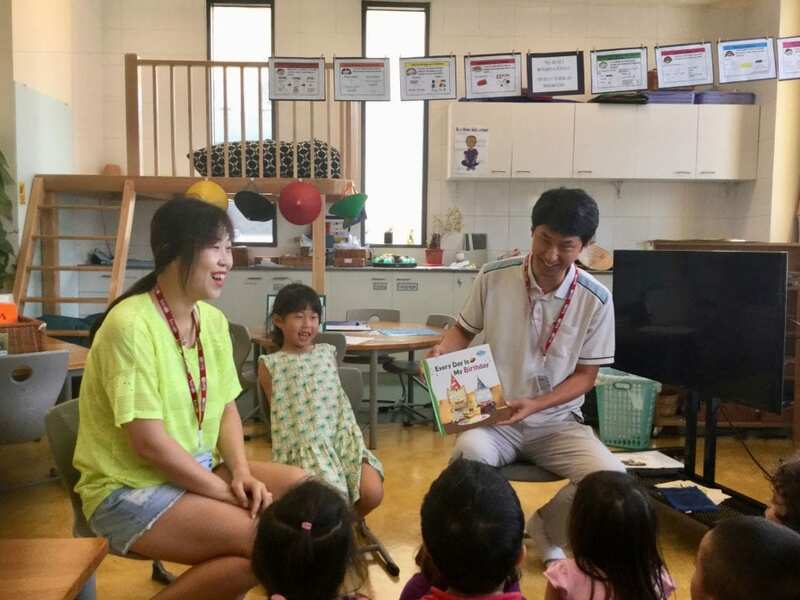 This week we were very lucky to have Ga Yun’s Mum and Dad, Mi Jeong and Jong Kuk as our mystery readers. We enjoyed a lovely book called Every Day is My Birthday. On Thursday we were also very happy to celebrate Ga Yun’s Birthday! 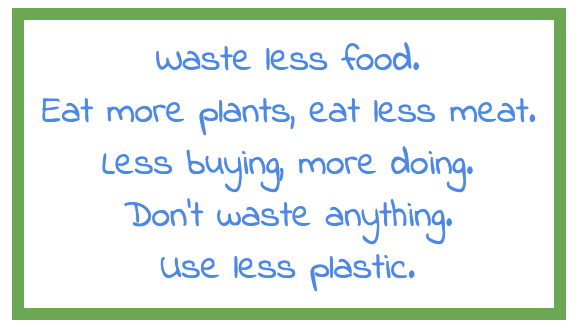 This Monday is EARTH DAY. Your child is encouraged to wear green to show the world they care for the natural environment. Monday 29 and Tuesday 30 are school holidays celebrating Vietnamese Victory Day. May 1 is International Labor Day and is also a holiday from school. 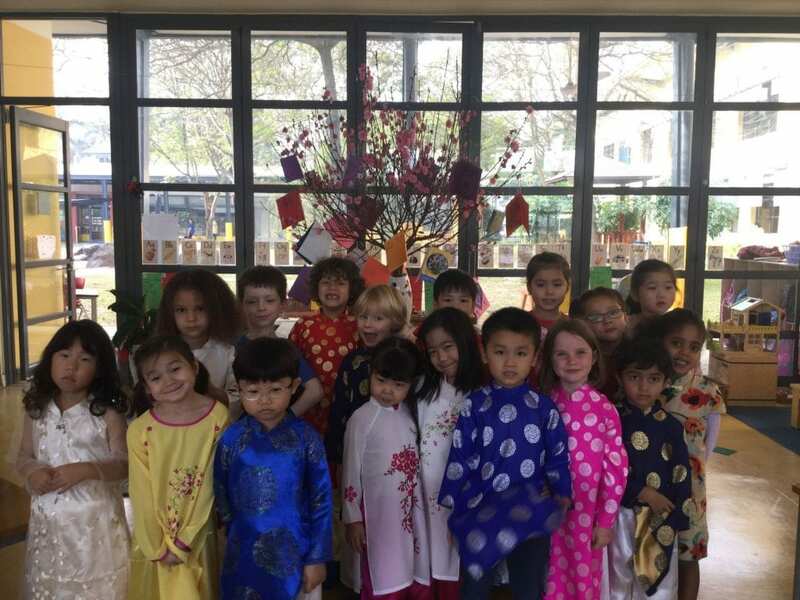 Thursday 2 May is the ES book character parade for book week. 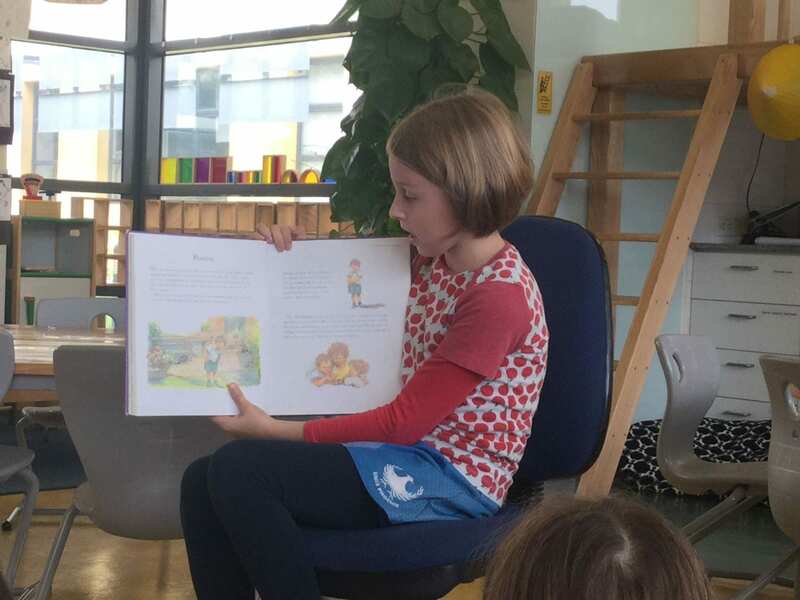 Your child is encouraged to come to school dressed as their favourite book character. Friday 3 May is our MRISA assembly. Your child is encouraged to wear UNIS clothes to support our MRISA volleyball teams. 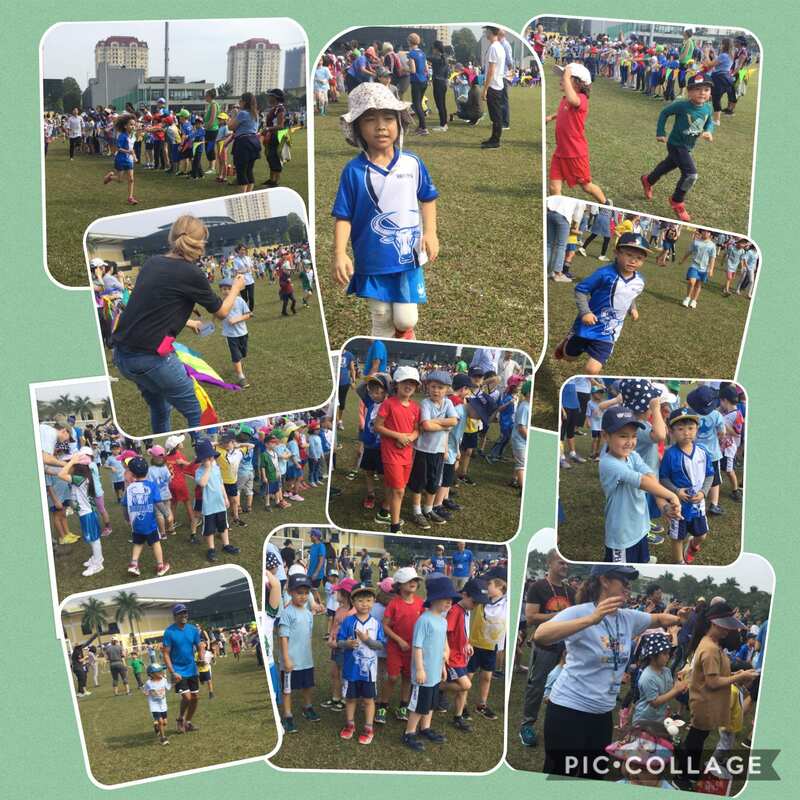 Yesterday K2D were very excited to join with the whole of UNIS to cheer for our APAC soccer team. The opening ceremony was very exciting. Some enthusiastic supporters from K2D watch UNIS play The Canadian Academy team from Japan. We cheered UNIS to a 3 -1 victory. On Tuesday Ms Michelle came to K2D and taught the children how to code using Blue-bots. The students are eager to share this learning with you at next week’s Student led conferences. Next Friday 19 April is our student led conference day. The children have been working very hard preparing to share their learning with you. Please ensure you sign up for a time to visit our classroom with your child. Please also be aware that there is no school for K2 students on this day. Your child will come to school with you just for the duration of the conference and visits to specialist classrooms. Please ensure your child does not bring toys, smart watches or jewellery to school. We have had lots of K2D children bringing these items to school in recent weeks. Along with the disappointment that occurs when these items are lost, they also cause friendship issues between students. I would really appreciate your help in ensuring these things don’t come to school. This week’s Mystery reader was Jenna’s mum Esther. As yesterday was also Jenna’s birthday Esther read a lovely book called I want two birthdays by Tony Ross. We also enjoyed celebrating Jenna’s birthday at the end of the story. Next Friday 19 April is Student-led conferences. 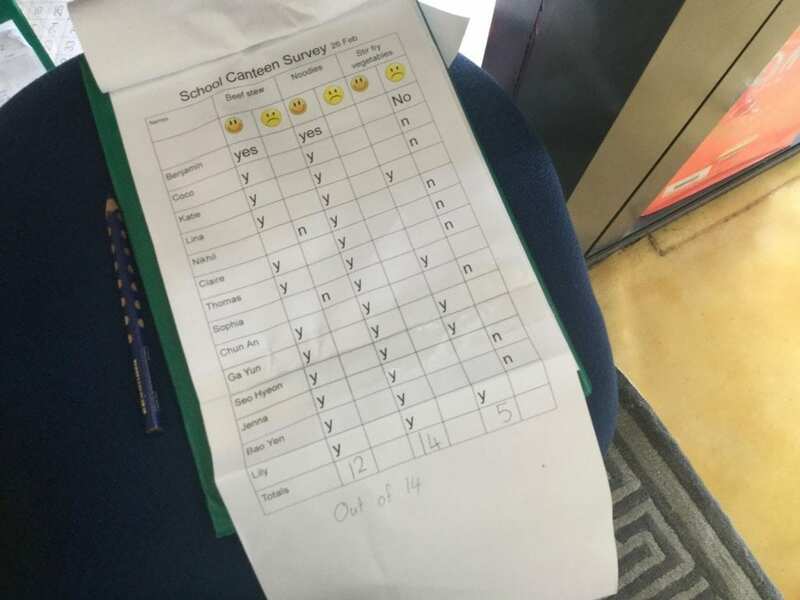 This is not a regular school day for children, children only come to school for their conference time. Monday 29, Tuesday 30 are school holidays celebrating Vietnamese Victory Day. May 1 is international Labor day and is also a holiday from school. I am so proud of your talented children this week. They pulled off a wonderful market day and a fabulous assembly. I am attaching videos of both of these. 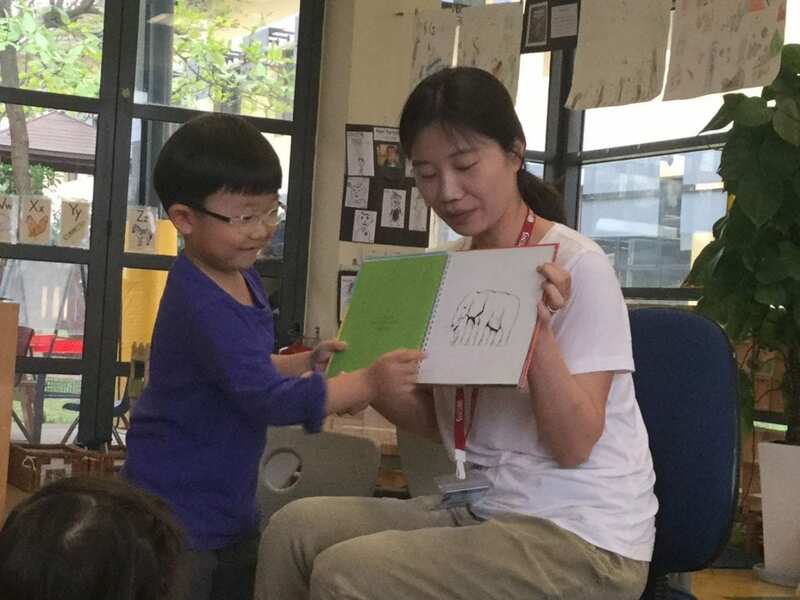 Yesterday we were very lucky to have Seohyeon’s Mum Heajin, as our mystery reader. 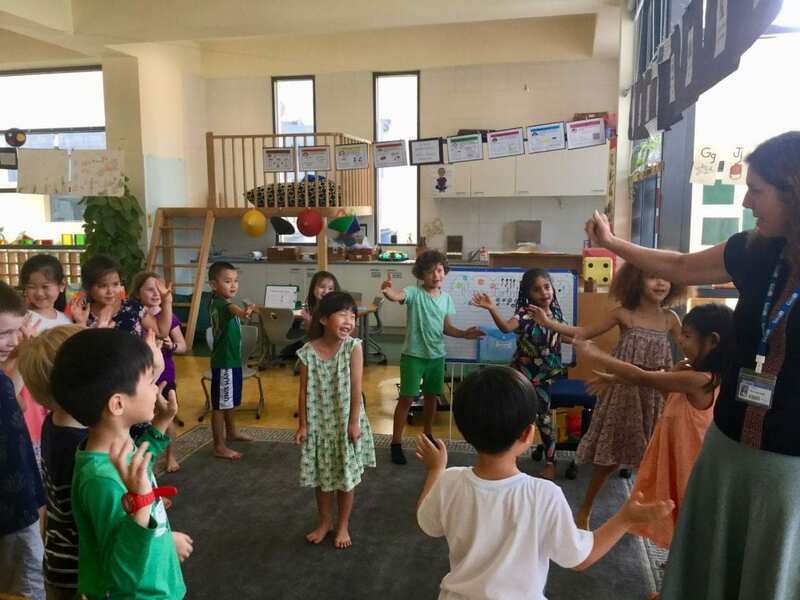 She read, acted out, translated and sung a Korean book about a magical bat. We were very impressed! 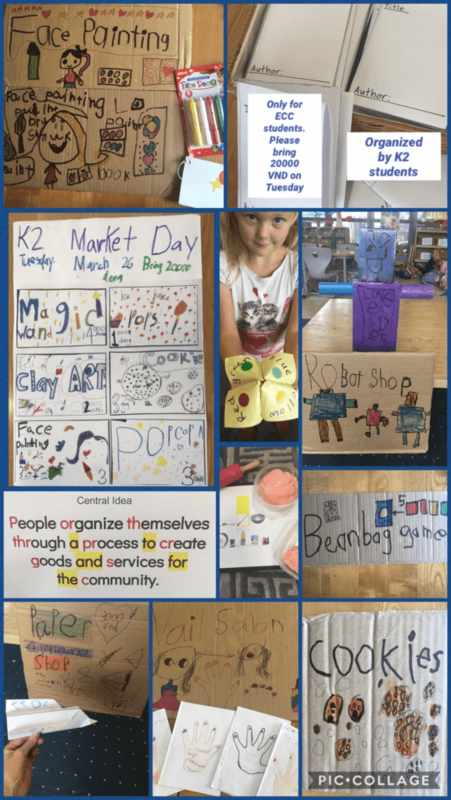 As the culminating project for the How We Organise Ourselves inquiry, K2 is organising a Market Day. 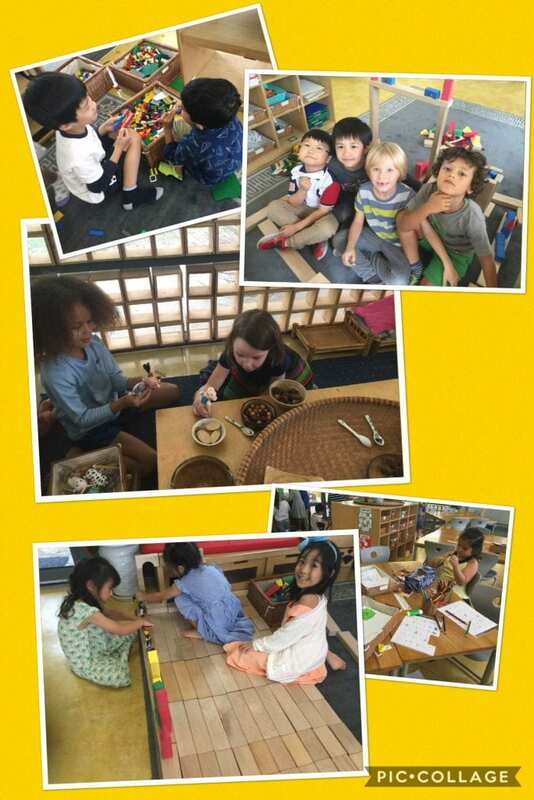 The children will produce and sell goods and services to other children in the ECC. The market will be on Tuesday 26 March. Please ask your child about what they are planning to sell. Please also send your child with 20,000 VND to spend on the day. Swimming in PE time starts again next week. K2D will be swimming on Monday and Wednesday and have regular PE on Friday. Please ensure your child has their swimming costume, swimming cap, goggles and a towel on swimming days. More information can be found in the links below. Please also see the link for details about next Friday’s Sports Day. 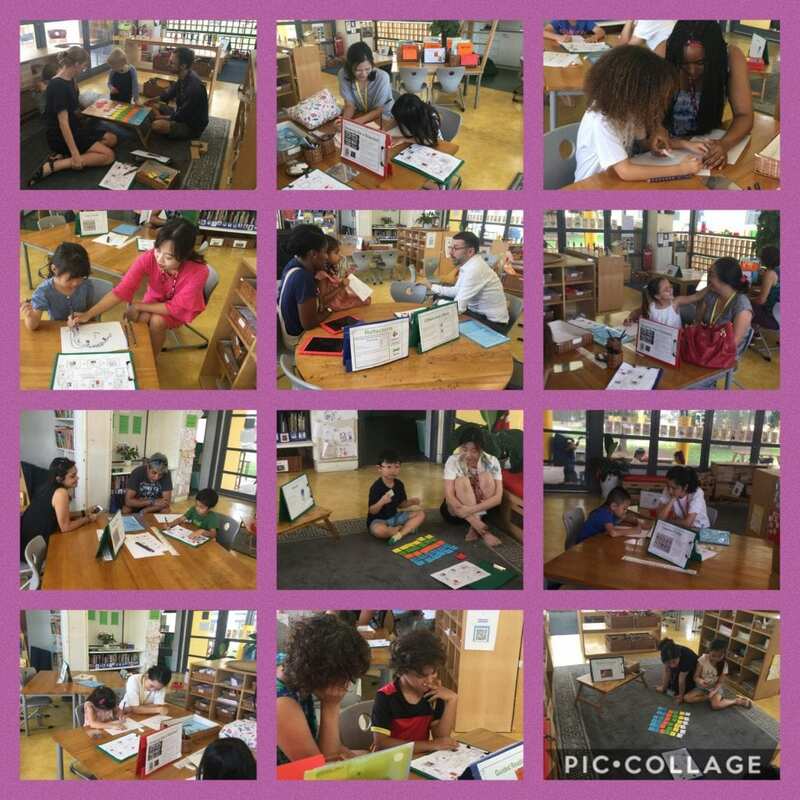 Thank you to all the parents who were able to come to the open classrooms today and yesterday. The children were very excited and proud to share their learning with you. On Tuesday afternoon UNIS will have a lockdown drill. K2D children are prepared for this drill. 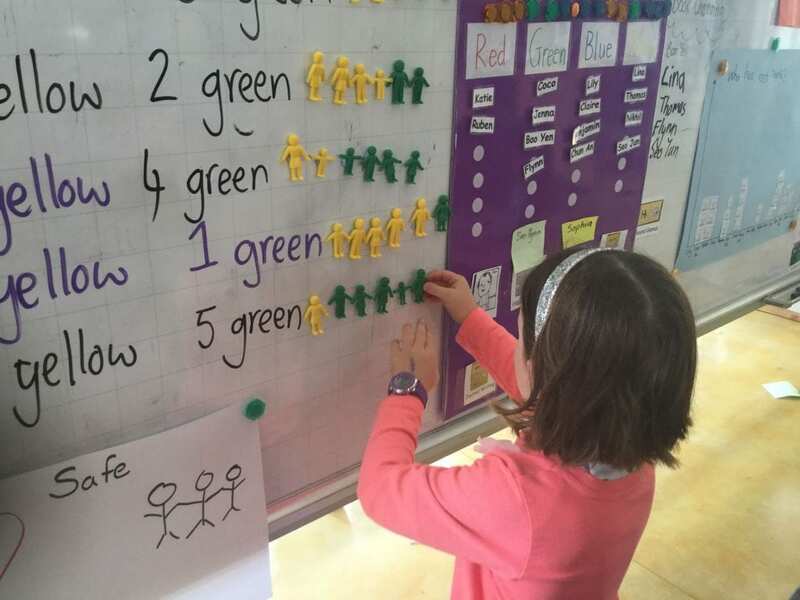 We have discussed and practised for what will happen in class. Please see the message from our Head of School, Jane McGee, below. Health and Safety is one of our highest priorities at UNIS Hanoi. On Tuesday, March 19th at 2:30 pm, the school will be conducting a lockdown drill on campus. This is an announced drill and all staff and students have been informed and trained on what to expect during a lockdown drill. A lockdown drill is one of the emergency preparedness standards required for our CIS accreditation. The drill will be conducted in the same manner as our regular evacuation drills. Our hope is that we never have an actual need to go into lockdown mode. However, if this unlikely event occurs, please be assured that UNIS Hanoi is prepared to deal with it appropriately. 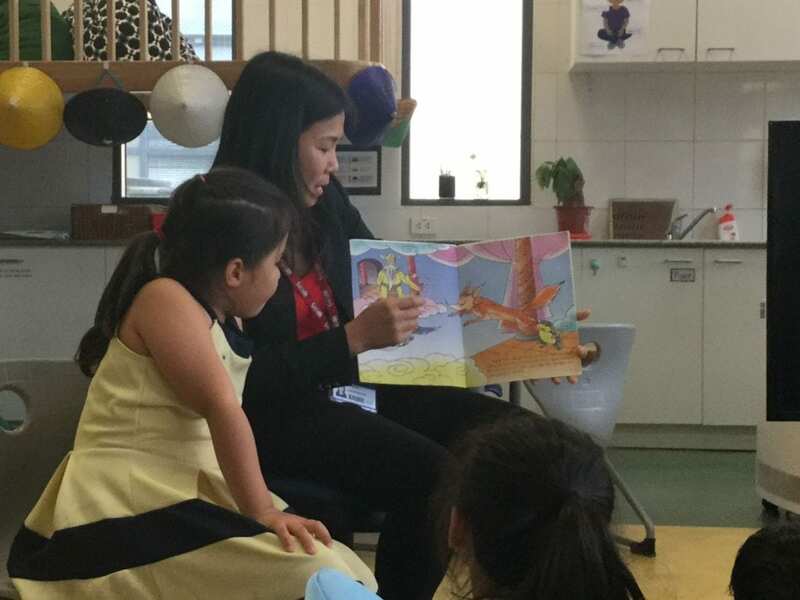 Thank you to Huyen, Katie’s mum, for being this week’s mystery reader. 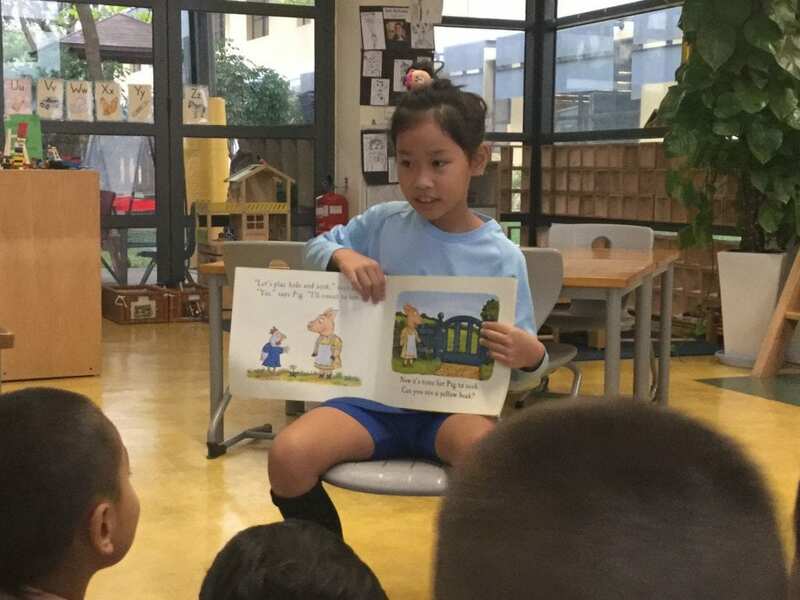 The class enjoyed listening to her read a story in Vietnamese about a clever frog. We had some very clever translators to help the non-Vietnamese speaking class members understand the story. 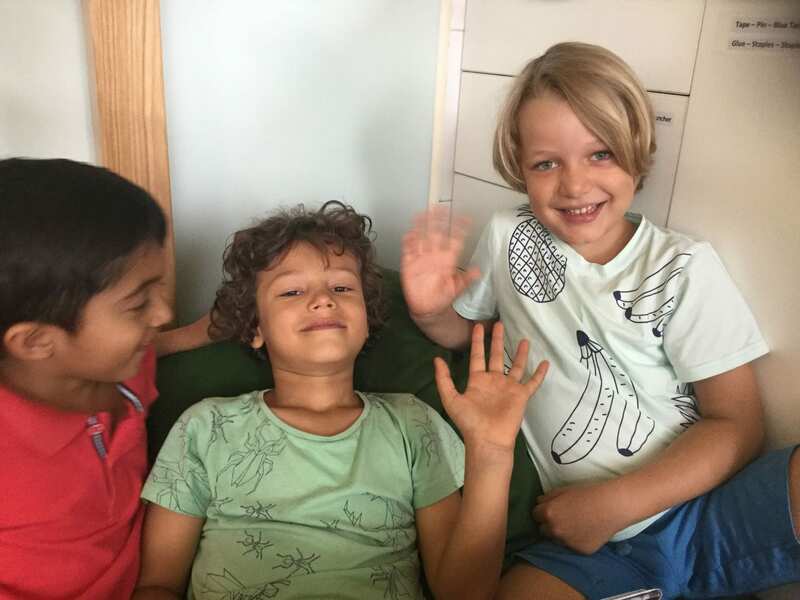 K2D children enjoying some choice time at the end of a busy day. Thursday 28 March is K2D’s Assembly performance. As mentioned in previous blogs, it will focus on Teaspoons of Change. If you have examples of ways your family is caring for the environment at home, I would love you to share them with me via email. I would especially love short videos. Thank you to the families who have already shared videos. Spring Break begins on Friday 29 March. Children return to school on Monday 8 April. I look forward to seeing you at this weekend’s Spring Fair. As part of our How We Organise Ourselves inquiry we are learning about procedure writing. 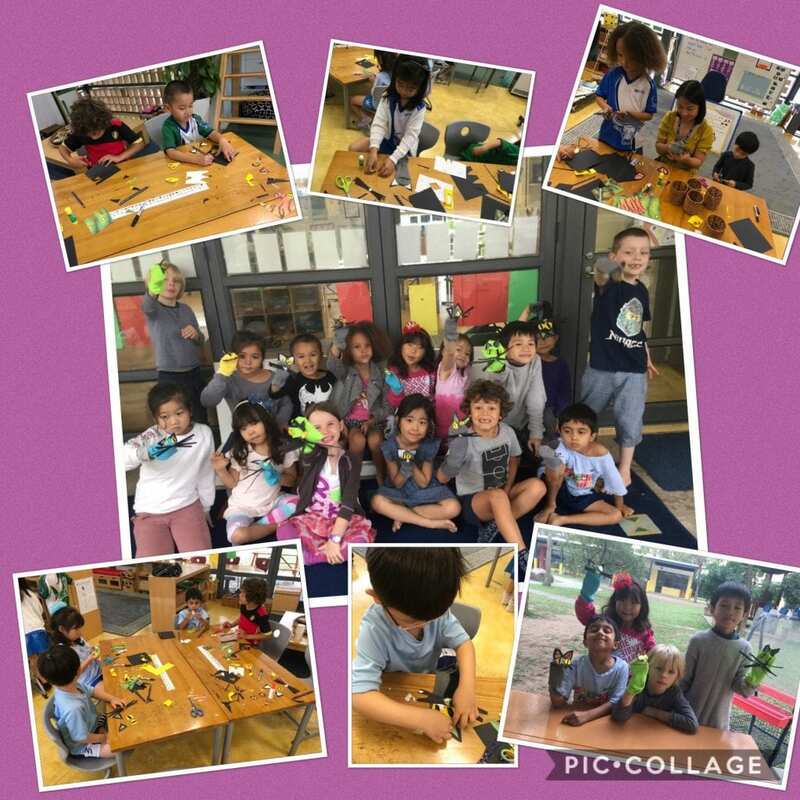 On Monday, the class successfully followed a procedure to construct sock puppets. 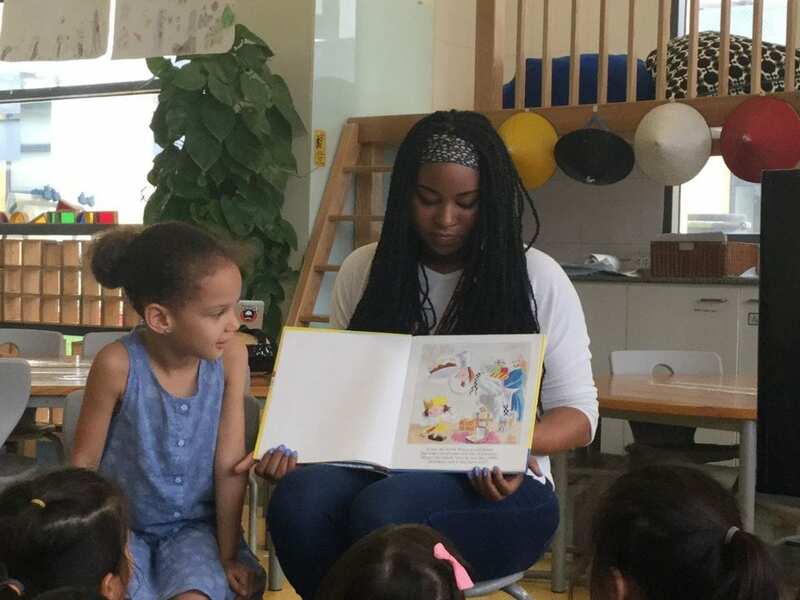 This week we were very lucky to have two mystery readers. 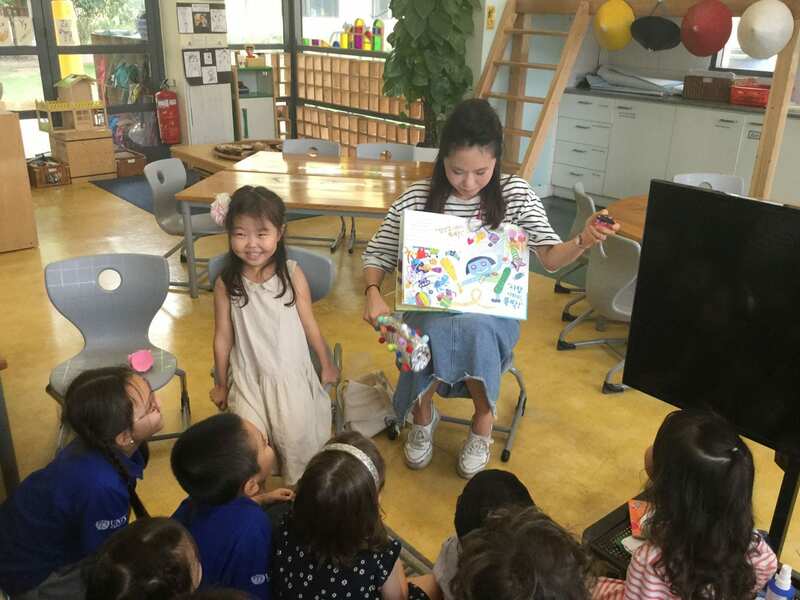 On Thursday afternoon Seo Jun’s mum, Jeein, came in and read to us a Korean book that featured optical illusions. On Friday morning Benjamin’s sister Kachi read us Hide and Seek Pig and Postman Bear by Julia Donaldson. If you haven’t signed up yet please click here. This Thursday 14 March and Friday 15 March are open classrooms days in our UNIS Elementary School. Please see the schedule below for classes that will be open for K2D parents. 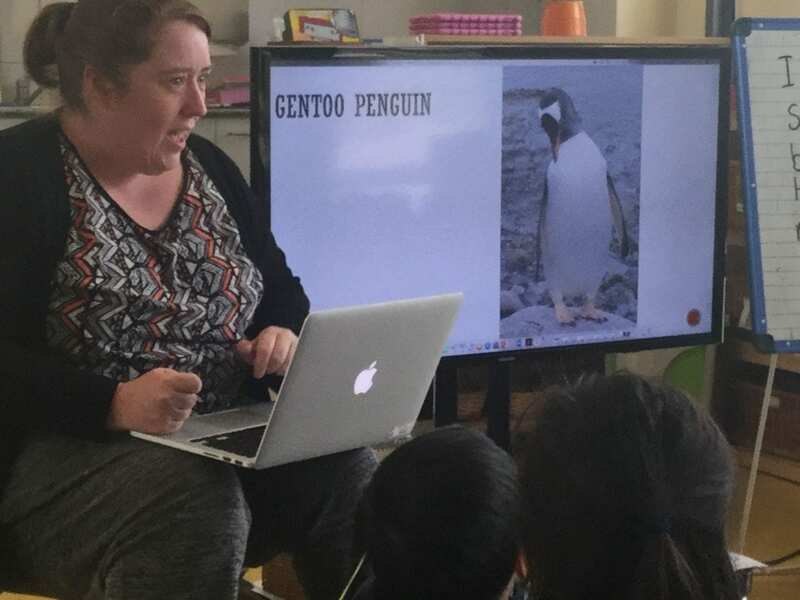 This Monday 11 March is a professional learning day for teachers. This means there is no school for children. Thursday 14, Friday 15 March, are UNIS open classroom days. Thursday 28 March is K2D’s Assembly performance. As mentioned in previous blogs, it will focus on Teaspoons of Change. If you have examples of ways your family is caring for the environment at home, I would love you to share them with me in this Google photo album or email them directly to me. I would especially love short videos. Thank you to the families who have already shared videos. 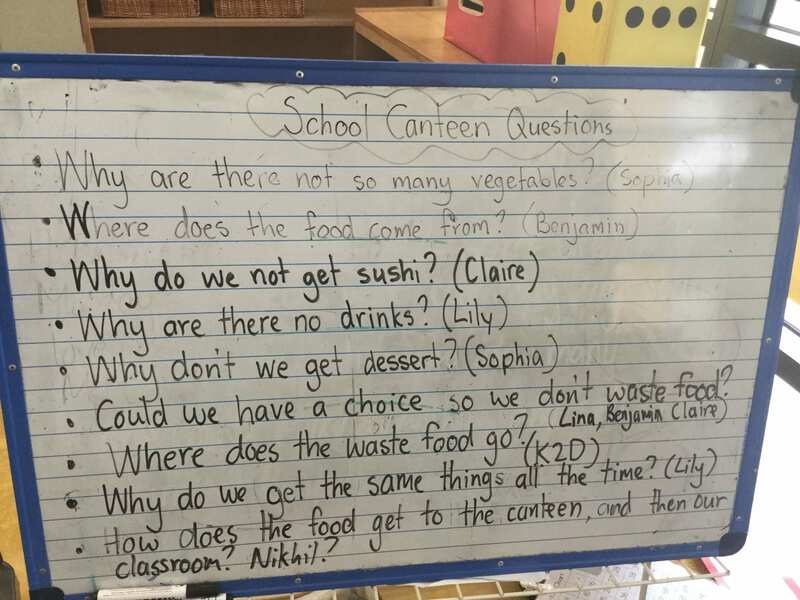 K2D have spent a lot of time this week formulating and asking questions. On Tuesday we visited the school canteen to find out about how our school lunches are produced. 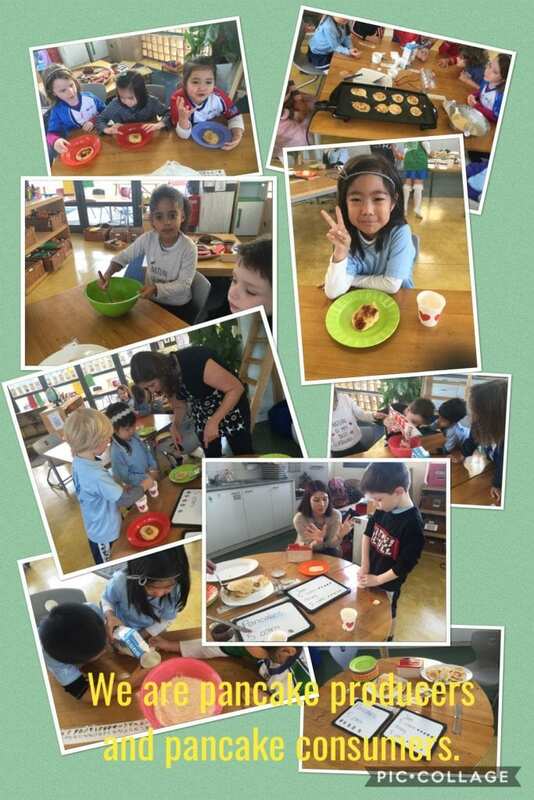 We asked lots of questions and learned about all the people and effort that goes into making our lunch. We also took action at the end of our visit by starting a survey of the foods we like and don’t like. We will give this information to the canteen so that less food can be wasted. 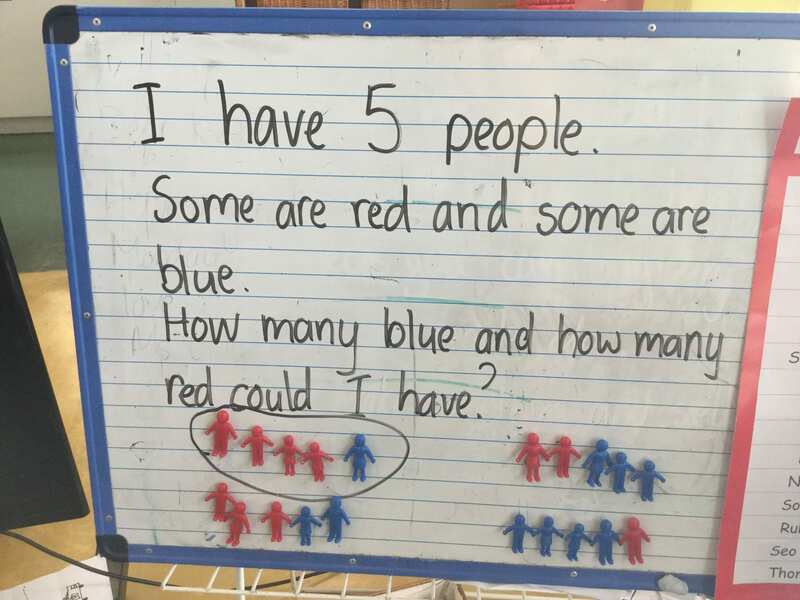 In math this week we have been exploring open-ended math problems. Thank you to this week’s Mystery Readers. We enjoyed listening to Nikhil’s dad read Tidy by Emily Gravett and Ruben’s sister Liv read Bonting by Shirley Hughes. If you haven’t signed up yet please click here. 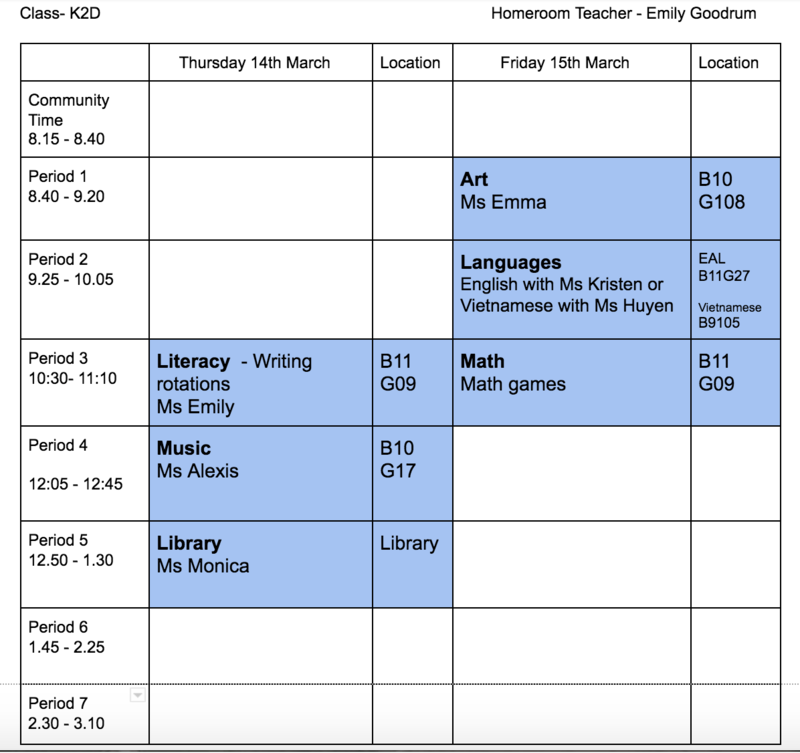 Monday 11 March is a professional learning day for teachers. This means there is no school for children. Thursday 14, Friday 15 March, are UNIS open classroom days. More details will come closer to the dates. Thursday 28 March is K2D’s Assembly performance. As mentioned in last week’s week blog, it will focus on Teaspoons of Change. If you have examples of ways your family is caring for the environment at home, I would love you to share them with me in the this Google photo album. I would especially love short videos. Thank you, have a lovely weekend. 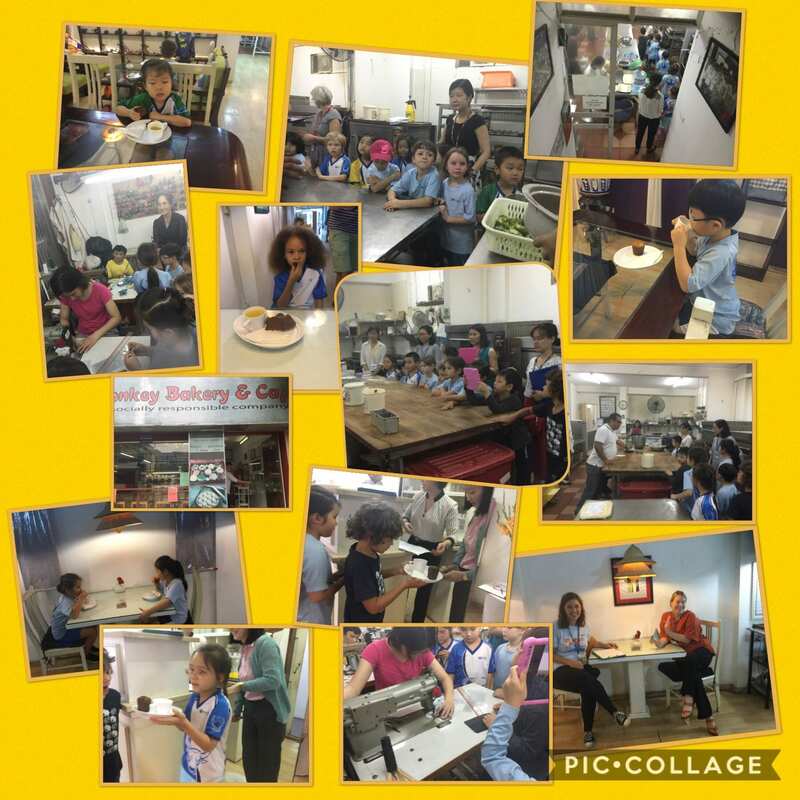 On Wednesday we had a wonderful time visiting the Donkey Bakery. We visited the kitchen and saw cakes and biscuits being made. We went upstairs and saw bags, clothes and toys being made from recycled materials. 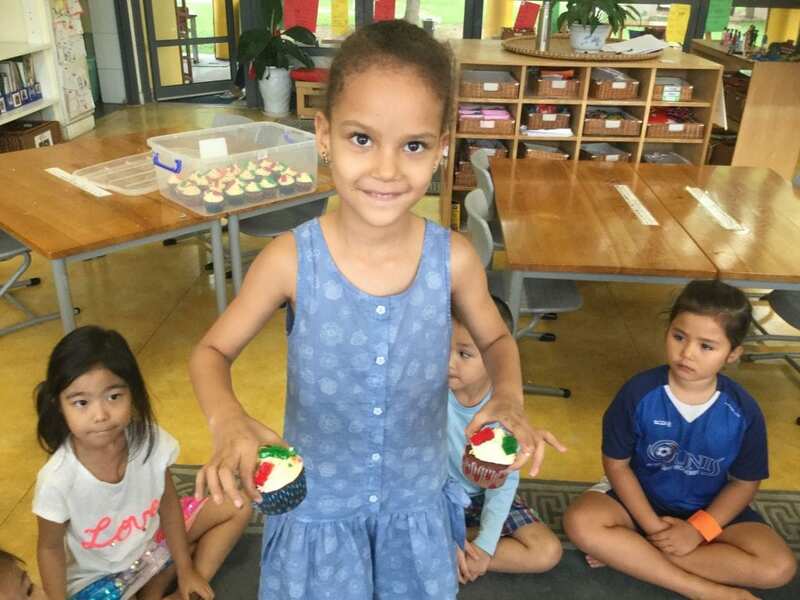 We went to the cafe and bought muffins and drinks and ate them with our friends. Through this field trip we saw goods being produced, people providing services, and producers and consumers playing their roles. As Donkey Bakery is a social enterprise, we were also fortunate to see a business that employs people with disabilities. We learned some sign language and could communicate our hellos and thanks with the staff. 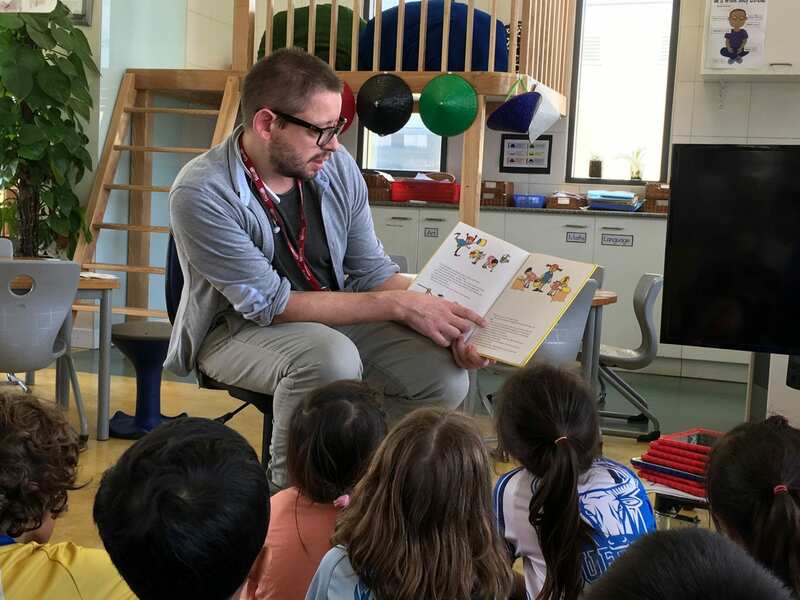 Due to illness in our class this week, we were unable to have our scheduled Mystery reader. 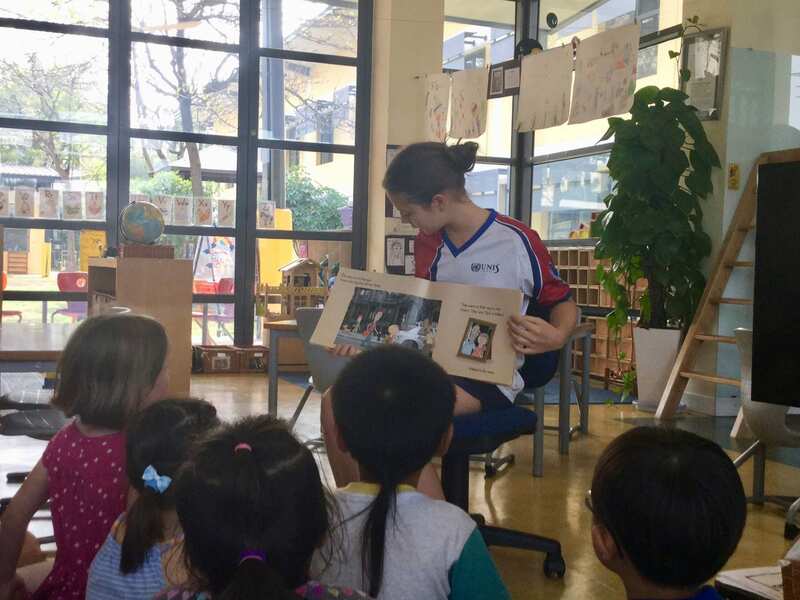 Lucky for us we had two UNIS readers come and share books with us. 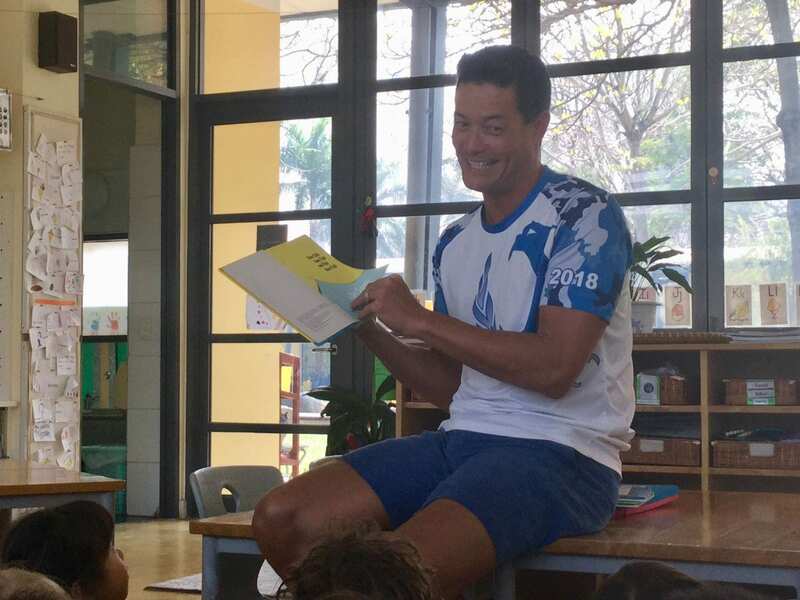 Thank you to Coach Hamilton who read us One Fish, Two Fish, Red Fish, Blue Fish and my daughter Lily, who read us Knuffle Bunny Free. If you would like to sign up please click here. I have had lots of positive feedback from children about home reading. Please continue to send the folder and books back on Monday so that the children can exchange their books. If you have any questions about home reading, please email me. Congratulations to our K2D families. Together we have raised over 10 million VND for Blue Dragon charity. Well done! We had a wonderful day on Tuesday celebrating 100 days of school. 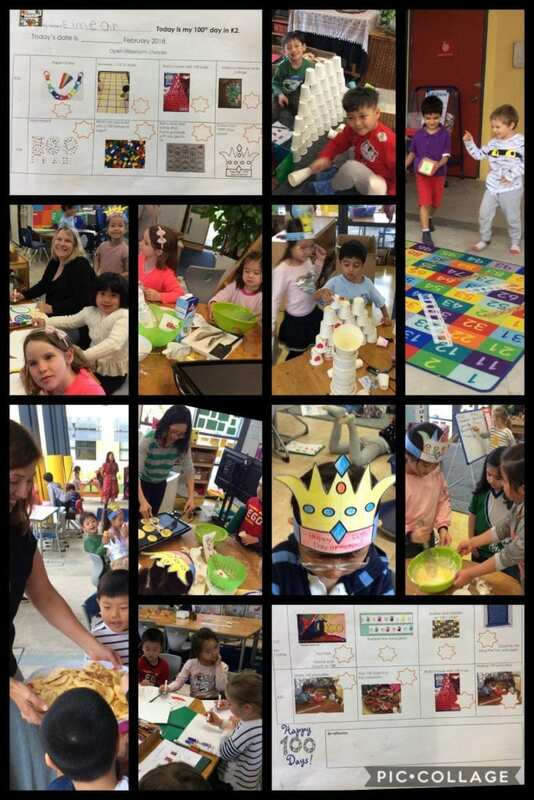 We had a range of math activities revolving around our 100 theme in all four K2 classrooms. 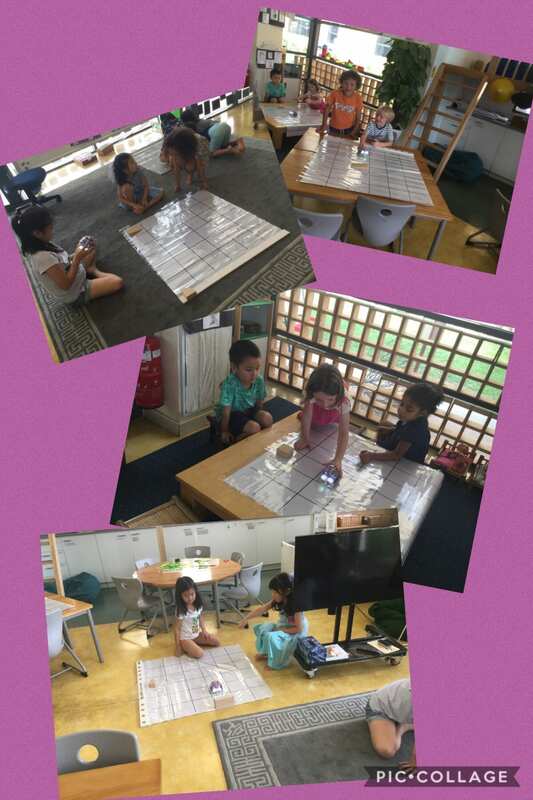 The children moved between the classrooms, joining in with activities. In our classroom, Ms Diep and I, along with many children, made over 100 pancakes. Luckily, we had lots of K2 friends to share them with. Today, K2D enjoyed listening to our first mystery reader. 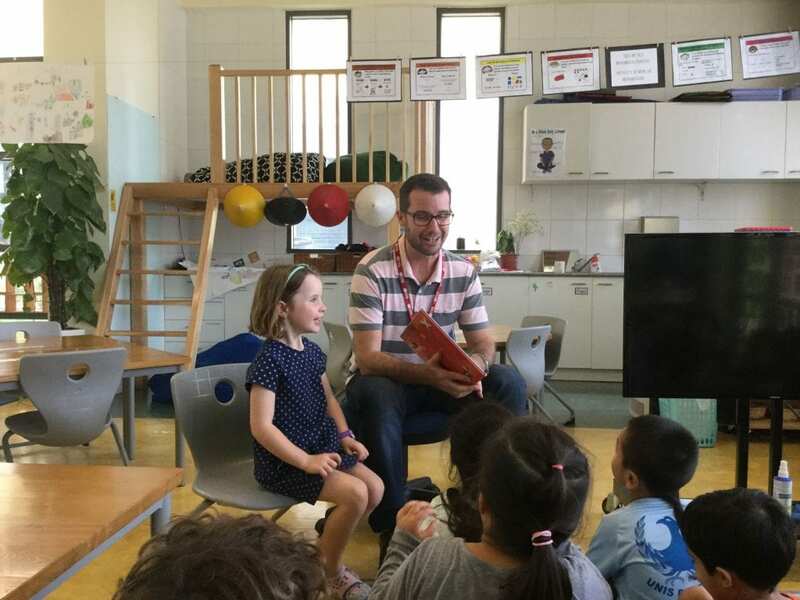 Thank you to Flynn’s Dad, Patrick, who read Did You Know Pippi Longstocking? 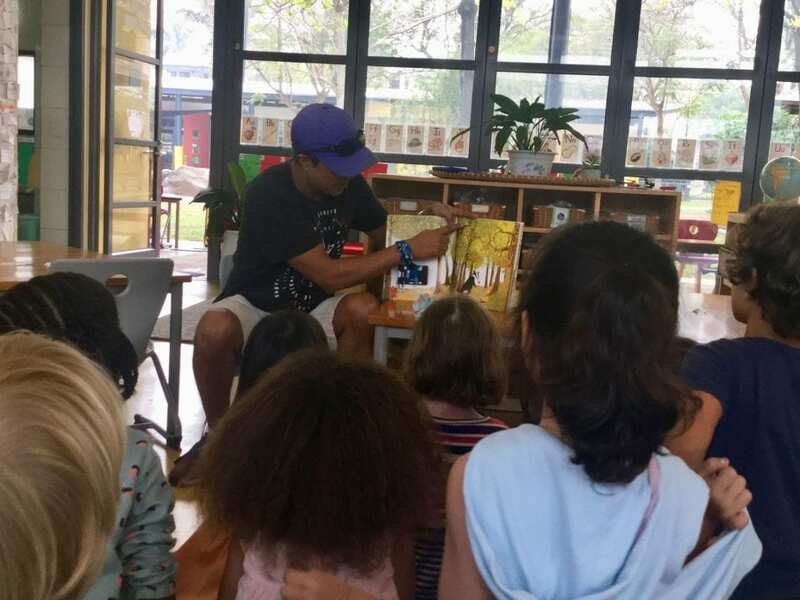 Please click here to sign up for you turn to be our mystery reader. If your child has older siblings or grandparents that would like to read we would love them to have them read too. 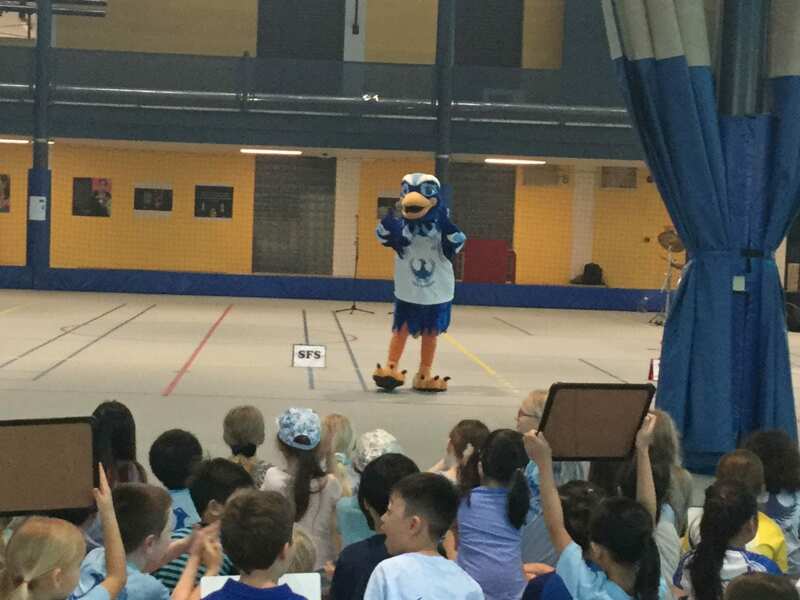 Our Blue Dragon Walkathon was such a wonderful experience for everyone in our community! It certainly turned out to be a memorable and inspiring occasion AND a gorgeous afternoon. All elementary students raced or walked with pride, enthusiasm and spirit! Donations to Blue Dragon are currently being calculated and it looks like we may have raised more money than last year. Please remember to send in pledge forms and indicate how many laps your child walked/ran. Please also put the total amount you are donating on the form. Pledge forms are due to homeroom teachers by February 22, 2019. Snack sale this Monday 18 February. Please send your child with 20,000 VND to buy 2 healthy snacks at the snack sale. Please ensure your child has a hat at school every day. A lot of children are enjoying playing in the mud kitchen or with the water at breaktime. This can result in very wet children. A spare set of clothes in the school bag is very helpful if your child becomes wet or muddy when they are playing. Donkey Bakery field trip Wednesday 20 February. Thank you to Karen, Esther and Sujoy for volunteering to join us for the morning. It was lovely to meet with so many of you on Wednesday at the Parent Teacher interviews and also see you at the Walkathon today. 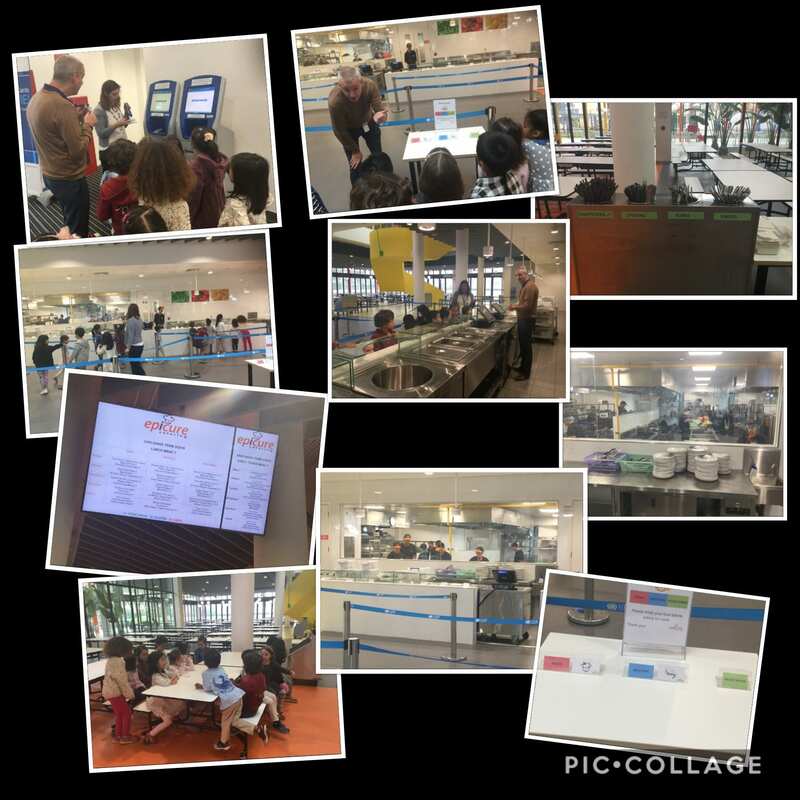 One of the things that makes our UNIS community so special is the fantastic participation, support and commitment from parents. Thank you! Please sign up to read a story book with our class here. Donkey Bakery field trip Wednesday 20 February. We need 3 parents helpers for the morning. More information to come. Have a wonderful Tet Holiday.